Radar data from digital tapes recorded aboard the space shuttle Endeavour will be used to produce maps with 33 times more detail than current map sets. While the space shuttle Endeavour was returning to Earth on Feb. 22 with 13T of raw radar images of the Earth's dry land, a NASA team was still assembling the hardware to crunch the data. During last month's Shuttle Radar Topography Mission (SRTM), astronauts recorded about 330 digital tapes of radar data. The Jet Propulsion Laboratory in Pasadena, Calif., is amassing a network of SGI Origin2000 servers, coupled with RAID and tape storage, to turn the raw data into 3-D topographic maps. NASA's partner in the mission, the National Imagery and Mapping Agency, will reformat the SRTM maps into a digital terrain-height data set for military and civilian use. The product will have a resolution of 30 meters'33 times more detailed than current near-global data sets. When the work is finished in 2003, JPL and NIMA will have assembled the most detailed topographic survey ever of almost 80 percent of the planet's dry land. The shuttle surveyed landmasses between the latitudes of 60 degrees north and 56 degrees south, excluding Greenland, Antarctica and other near-polar regions. The intensive processing will take JPL seven to nine months to finish after the processing system passes muster early next year, said David Perz, ground data processing system project element manager for SRTM. Although SRTM's goal was two passes over each piece of land, Perz said, some spots had three or four passes during the nine days and 18 hours of surveying. Any project has 'technical problems you have to solve, and you have to solve the [shuttle] flight problems before the ground problems,' Perz said. At times, his team had to slow down development so that funding could be diverted to shuttle instrumentation problems. NASA acquired the SRTM data by a technique called fixed-baseline interferometry. The shuttle carried two sets of radar antennas, one fixed and the other on a 200-foot retractable mast. Each radar device beamed pulses of radio waves down to Earth and measured the reflections. Combining the measurements will yield a 3-D data set, much as the human brain combines separate images from two eyes into a 3-D view. Endeavour's astronauts recorded raw data onto 40G, 19-mm digital tape cartridges from Sony Corp. of America of Park Ridge, N.J. The astronauts used a couple of portable computers to control the data recorders, Perz said. JPL will process about 220 data tapes made in the C-band at a 5-centimeter wavelength and a 6-GHz frequency. The astronauts also filled about 110 tapes with X-band images at a 3.1-centimeter wavelength and 9.6-GHz frequency. Those tapes will go to the German Aerospace Center, Perz said. The German and Italian space agencies contributed the X-band imaging system. After the shuttle landed, NASA engineers began copying the Endeavour tapes onto Sony AIT2 tape cartridges. One of two copies of each original will be used for primary operations; the other will be used for backup. The shuttle orbited at an inclination of 57 degrees to the plane of the equator. SRTM's raw data came in long, narrow strips either on the shuttle's ascending path, when it moved from southwest to northeast, or on a descending path from northwest to southeast. JPL will start with the data strips covering North America, said Tom Hennig, NIMA's SRTM program manager. More elevation data is already available for cross-checking North America than for some other regions. 'Seven to nine months to do the whole planet'that's pretty quick,' Perz said. Using the data transfer subsystem, an eight-way, rackmount Origin2000, JPL engineers will identify the ascending and descending images of a particular landmass. The strips next will pass to the topography processing subsystem, a 32-way Origin2000 that will produce roughly 28T of intermediate elevation and measurement-error data. Next, a 16-processor Origin2000 mosaic-processing subsystem will take all the narrow strips covering a given continent, make corrections and align the data sets based on identifiable tie points, or features recognized in two overlapping strips. Mosaicking results in two new sets of maps with elevations and error bars. They will go to the height quality-assurance subsystem, an eight-way Origin2000. A control and database subsystem will help JPL manage the complex project. Engineer Joanne Shimada said JPL has not yet procured the production system but is doing the development work on a Sun Microsystems Ultra Enterprise 4000 platform. The production platform likely will be a similar midrange server. Each of the more than 14,000 finished maps will cover a one-degree-square cell, totaling roughly 1T, Perz said. The Origin2000 systems altogether have nearly 2T of RAID and internal storage. The ground team is still developing the mass-storage system and will finish purchasing equipment by early next month, Perz said. Once JPL hands off the processed data to NIMA, the Defense agency will convert the radar maps into its Digital Terrain Elevation Data format. NIMA staff and contractors will do the finishing work, Hennig said. NIMA plans to make public several data products, including a near-global data set with 100-meter resolution and a data set of the United States with 30-meter resolution. JPL engineers manually worked up images from a small amount of data beamed down during Endeavour's mission, Perz said. The images covered about 500,000 square kilometers and were not fully calibrated but showed that the instruments were working properly. 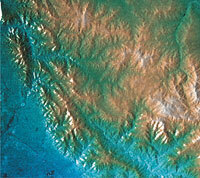 Sample images appear on the mission's Web site, at www.jpl.nasa.gov/srtm.